Russia currently has about 20 local payment systems, in addition to the big international players. The largest Russian payments systems are Union Card and Sberbank’s PRO 100. In response to the unexpected blocking of transactions on cards issued by several Russian banks by international payment systems Visa and MasterCard, Russian banks have begun to seriously consider establishing protection mechanisms. An alternative would be to switch all internal card transactions to a domestic Russian alternative processing system. China’s Union Pay system offers another option, and one that would be of mutual benefit to both nations. Contenders for the title of "national"
Russia currently has about 20 local payment systems, in addition to the big international players. Most of these are small companies, but there are two large systems. One is Union Card – one of the first Russian payment systems, established in 1993. Union Card includes about 300 financial institutions. The second is the payment system Golden Crown, which brings together more than 500 banks in Russia and the CIS countries. However, experts say the most promising billing system is Sberbank’s PRO 100, which has been attempting to carve out a niche for itself on the Russian market for some time, but without much success to date. However, recent events may provide it with an opportunity to step out of the shadow. "Its primary advantage is that it uses the M/Chip technology developed by MasterCard. So it would not require the purchase of new equipment for banks to move to the new system, it will only need some software enhancement," says Yelena Orlova, chairwoman of PayU, a payment processing NGO. "To join a payment system, PRO 100 requires an average of 1.5 months," says Andrei Nesterov, director of strategic communications at Universal Electronic Card, the company that is producing an identity E-card for Russians that replaces the need for a number of key documents. According to Nesterov, the PRO 100 payment system is free to use for citizens and all you need is a universal electronic card. For banks, it will cost about 1.5 million rubles ($42,000) to enter the system, says Nesterov. Even the maintenance services for this system are cheaper than that of foreign systems. According to Alma Obayeva, chairwoman of the non-commercial partnership 'National Payments Council', it will take at least six months before the local system is launched nationally, but it will need at least a year to gain a customer base and be capable of competing globally with Visa and MasterCard. "The practice in which a salary card is issued on the basis of a local payment system and credit based on Visa and MasterCard is characteristic of some countries,” she explains. However, domestic payment systems have one major drawback. "Consumers have a problem if they want to use their debit and credit cards abroad, where there is no support for the Russian system. And in the current situation, it would be problematic to bring any of Russia’s developments into the international arena," said Tamara Kasyanova, the first vice-president of the Russian Club of Financial Directors. PRO 100 cards are currently not served outside of Russia. Yelena Orlova believes that it is only a matter of time, an opinion that is borne out by the experiences of other countries that already have national payment systems, such as China and India. 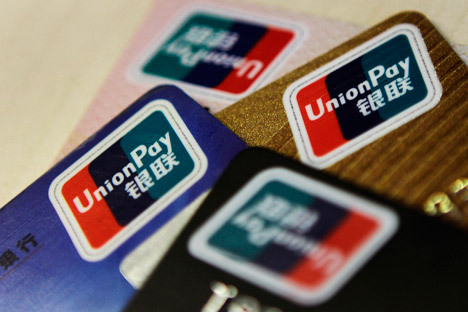 Until a Russian payment system appears, an alternative to Visa and MasterCard could be the Chinese system called UnionPay, which entered the Russian market in the fall of 2013. This national payment system was established in China in 2002 and in just several years has acquired international status. Most experts agree that out of the current situation, those who will lose are the Visa and MasterCard payment systems, which are now at risk of handing a large market share, in the form of Russian banks, to their rival, China. The text is based on materials published by Vzglyad, RIA Novosti, Kommersant.